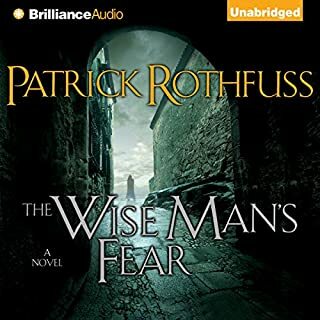 Fell in love with reading after getting this book at a young age, I bought this audiobook now many years later and have subsequently remembered why I fell in love with reading/books. Great narration and a gripping story. Fun story. Good new world. It’s a good story. The performance is really great!! Except at some moment where I had problems with the voice the actor gave the character he is overall an amazing storyteller! A must for all fantasy fans. I went into this book completely blind to the story. I had just finished the Sword of Truth series and searched on whatshouldireadnext.com. That’s where I found the Mistborn trilogy. I did just enough research to know this had a chance to grip me and my love for high fantasy. And WOW. I absolutely love this book. The story follows a tried and true structure. The run down underclass wishes to rise up against their oppressors, a young hero discovers unkown powers that propels her to instant hero status, big battle, some people die. There is nothing wrong with this. It’s basically the way every fantasy novel goes. The Final Empire creates a fresh experience within that old structure. The performance of this audiobook is also brilliantly delivered. 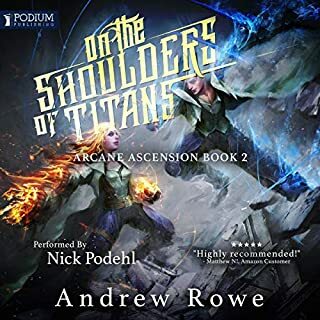 I have listened to, and been able to enjoy other audiobooks that I felt were poorly performed (The Sword of Truth series for example). But the performance of this book feels absolutely perfect for the tone and setting of the story. As this story was read to me I could see it all unfold in my minds eye. It was perfect and helped enhance my enjoyment of the story. If you love fantasy novels I highly recommend this book. I am so happy that I discovered this series after it was completed but before the inevitable movie. Nothing was spoiled for me and I don’t have to wait to rush through the next two books. I can’t wait and I suggest you get started as well. Amazing book. My favourite chapter was chapter 30 I think. Can't wait to get started on book two. very entertaining! amazing book cant wait to listen to the next one in the series. A new masterfully built world. Twists and turns, action and intreage. A new and fascinating form of power. A relatable heroine. A larger than life hero. Wonderfully quirky comrades and a dark lord that nead's vanquishing. what more can you ask for in a fantasy novel!! The performance of the narrator was fantastically executed. Giving life to each character with an assortment of accents and intonation. Overall an amazing start to what I can only hope is a fantastic series. One of the best fantasy books I’ve read in a while, and the narrator was absolutely great! Couldn't stop listening. I bought this book to listen to on the bus to work and back but I ended up listening to it as I worked too, very engaging and exciting! 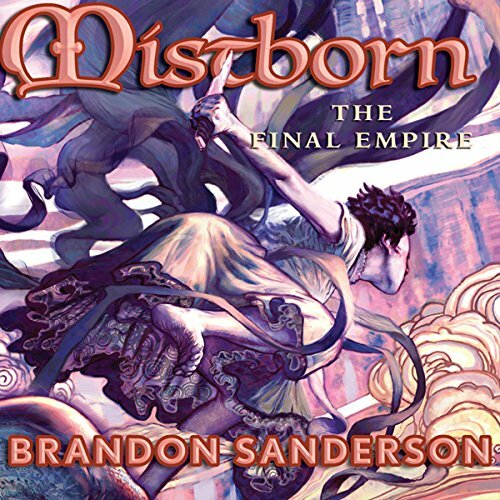 I started the Mistborn series because I read the Stormlight Archives by Sanderson and wanted more epic fantasy. I was a bit skeptical at first because there were so many similarities between styles and even character names between the two-book series. 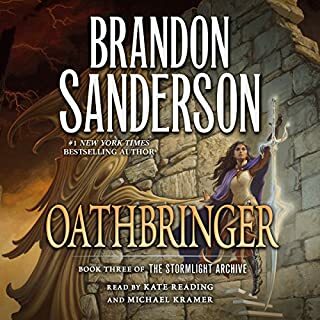 The Mistborn Trilogy being a predecessor to Stormlight, I thought I might be disappointed… I was wrong. 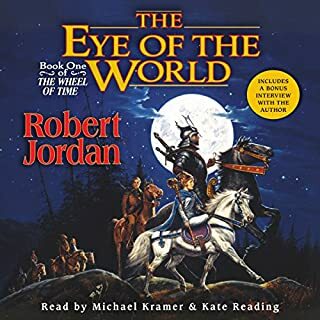 It's easy to see why Robert Jordan picked Brandon Sanderson to finish his Wheel of Time series. 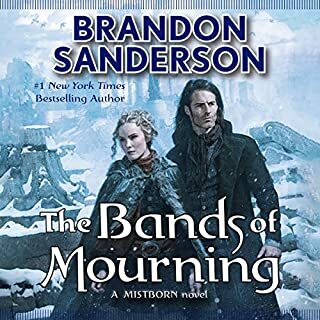 Although I noticed some distinct similarities in characters between Mistborn and Elantris (another great listen by Sanderson), he has so much imagination in how to make a world unique. This story is not just another dwarves/elves/orcs story line and magic doesn't just "exist". There's a thought process behind where it comes from and how to use it and the dangers and consequences of doing so. 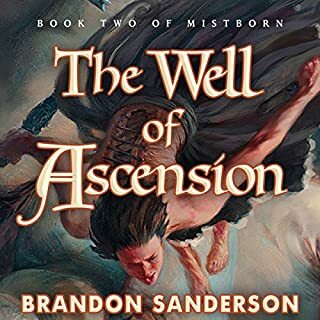 I'm already about halfway through the next book in the series, The Well of Ascension, and it's fun to see how Sanderson left threads for the series to follow yet at the end of Mistborn, there didn't feel like there was anything unfinished. One remarkable thing about this series is how well the history, politics and overall backdrop of this story is explained. Never once was I bored about learning new things about this fascinating, desolate world. Also unique is that the protagonist of the book is a woman, and Sanderson does a great job of portraying her realistically. Even though she gains enormous power over the course of the narrative, the author does not forget her origins, and her origins continue to define how she reacts to her circumstances throughout the book. In fact, all of the characters, even the minor ones, display realistic motivations for their actions, and come across as very real. Michael Kramer, once again, did an amazing job with the narration. I'm amazed at how he manages to create a voice, tone, and referent emotion for each character. He really brings the characters to life and adds an immeasurable depth the story. He is an incredible performer and his narration here is “still” flawless. For those familiar with A Game of Thrones (George R.R. Martin) and Wheel of Time (Robert Jordan), Sanderson's style fits comfortably between these two tomes. His story is not as "gritty" and "real" as Martin's series and his story is not as fantastic as Jordan's series. The idea behind the magic system is well-thought out an the characters are easy to like. My “only” gripe is that I found the writing to be a bit heavy handed at times. For instance, I felt there was a lot of repetition that reminds the reader over & over again about the same character points - ex. I found myself often thinking things like "okay okay x has had a hard life, she doesn't trust easily, alright I get it I get it." It's consequently very easy to read & follow; I think I'd just prefer a style that's a bit more subtle. I think this issue also led me to dislike one of the main characters (Vin) more than I otherwise would have - I found myself more often feeling impatient rather than sympathizing with her when hearing narration about her doubts, fears, etc. 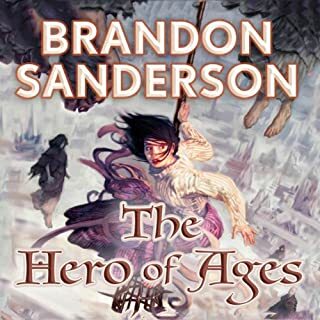 I just finished the third audio book in the "Mistborn" trilogy and wanted to write my review starting with th first to let anyone know who is wondering whether to invest their time in another series to absolutly read this one. This story is epic. 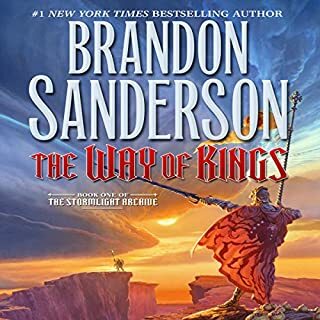 Brandon Sanderson writes a classic and was clearly the right pick to finish Jordon's WOT series. The narration by Michael Kramer is award worthy. He not only gives a distinct and believable voice to each character, he brings them to life. Best possible use of a free credit, ever. Concise and descriptive narrative pulls you in right from the start. 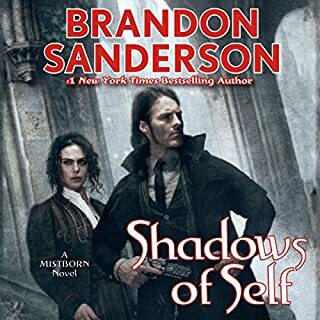 Sanderson goes into great depths of dealing with themes of politics, oppression, prophecy, rebellion and religious conflict and pulls it off very well. Almost too well. The "magic" is brilliant, the action is great but these elements only work well because of how tied together character depth and development is to these sequences. The magic is also explained in a practical theoretic that just doesn't leave the hocus-pocus to your imagination. The explanation is set in the history and backdrop of the story and is grounded in its own sort of realty making it very believable. And each action has a reason and decision that carries a lot of believable weight, consequence and character growth behind them. In terms of narration, Michael Kramer paints a lavish picture of this world in a somewhat dry, but remarkably colorful and believable way. Several different voices and dialects enliven the dialogue immensely. He really brings this story alive and it is one of those rare occasions that the narrator adds something more to the story making it that much more special than reading it on paper. Another remarkable thing about this series is how well the history, politics and overall backdrop of this story is explained. Never once was I bored about learning new things about this fascinating, desolate world. I know I am raving endlessly about this series, but it is very hard for me to find anything I did not like about it, so much to the point that I can't think of anything. Other people on this site have complained of following a set "workshop" pattern of putting a story together, I do not see it that way. If your going to pick this story apart for that, then there are countless other classics you could do the same to, and a lot of them, while being exquisite, are not nearly as immersive and action packed as this story. This is one of those truly gripping rarities that is quite long and expansive, but is never a dull moment. This series is a true fantasy classic that has rightfully earned its place among the greats in this genre. Book 1 of a great series that is not to be missed! 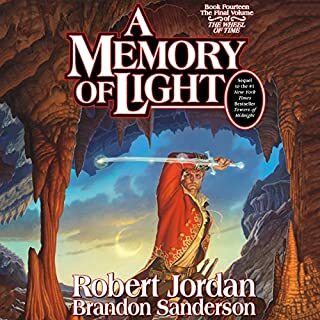 I knew little of Brandon Sanderson when it was announced that he was selected to finish the Wheel of Time series after the death of Robert Jordan. I decided to check out some of his work to get a feel for his writing before his first Wheel of Time novel was published. What I discovered was that I had been missing out on one of the best Fantasy authors writing today. 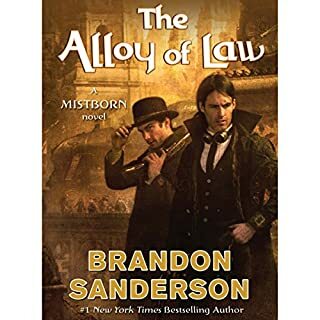 Mistborn is an excellent series and I have thoroughly enjoyed every book in the series. 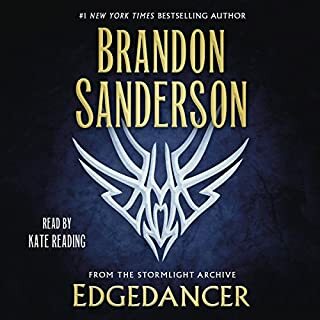 I am a big fan of Fantasy and I was completely drawn into Sanderson's world of Allomancers and all of the interesting things they could do right from the start. Michael Kramer does an excellent job of bringing these interesting characters to life so expect this book to grab you from the start and never let go. This book has a lot going for it. 1) The world depicted is really very unique. The book depicts the second round in a fight between good vs. evil. In the first round evil had won and 1000 years have passed. This is my first review, but I plan on reviewing every book I listen to from here out. 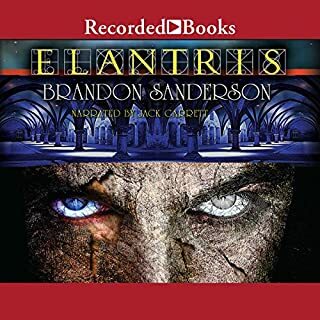 I tried listening to Brandon Sandersons first title, Elantris, but had a hard time getting into it. 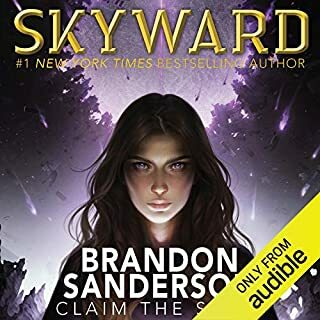 I thought I would give Brandon another shot though since I enjoyed Michael Kramer's narration in The Eye of the World series, by Robert Jordon so much. Mr. Kramer showed his true flare for subtle voice dialects allowing the listener to immediately know who is speaking before hearing who the author told you it was. He is a bit mono tone but never the less is one of my favorite narrators. My first experience with Brandon Sanderson didn't disappoint. 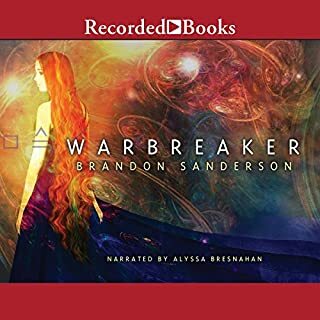 The story of the Skaa rebellion, led by Kelsier with serious backup from Vin, the female Mistborn, is entertaining, engaging, and slightly different from other fantasies. At its foundation is good versus evil. And then Sanderson throws in some fantasy, magic, conflict and sprinkles in just a bit of romance. Thieves, Dark Rulers, Obligators, Secret Keepers, and even Inquisitors are supporting characters that keep the plot moving forward without causing confusion to the reader. Kelsier, also known as the legendary Survivor of Hathcin, is a nearly mythical being to the Skaa and he is the mastermind behind the rebellion. But Vin, the newest of his thieving crew who joins their network to infiltrate the nobility, begins to learn she has quite a few Mistborn powers of her own. By the end of this first of three books she becomes legendary in her own right. The book may have benefited from a little additional editing because there is repetition of things the reader knows. We learn how the power of the metals and they work over and over again. We even get a recap of previous action in the book multiple times. It's almost as if Sanderson believes his reader can't remember from one chapter to the next. While this can be somewhat annoying, it doesn't really detract from the overall good plot and well developed characters. There is foreshadowing that is critical to the plot, so the reader has to pay attention. And in fact, some foreshadowing in Book One comes into play in Book Two, The Well of Ascension. But the book keeps the reader pretty riveted, so this isn't too much of a problem. Michael Kramer is an apt reader and once you learn the timbre of his voice, there is no problem differentiating among the characters, including the reading of someone's diary which is inserted between chapters. His pace is good and enunciation excellent. I highly recommend the book. I am writing this after having finished the entire trilogy. 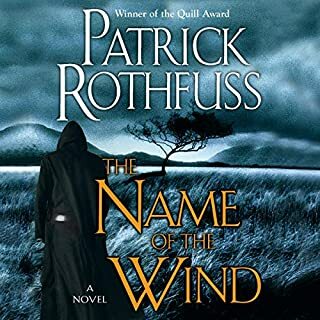 While this was an incredible book and stands alone just fine on its own, I wanted to reserve judgement on each book till I finished the trilogy in order to put each one into perspective. This was my first Bandon Sanderson book and I loved it. At first, it was challenging to get into the whole concept of Allomancy but I eventually did and appreciated every aspect of this masterpiece. The books moved quickly, the story is rich in its treatments of many aspects personal character, politics, government, philosophy and religion. And each character is fully developed to the point where we probably care about all of them including some of the bad ones. 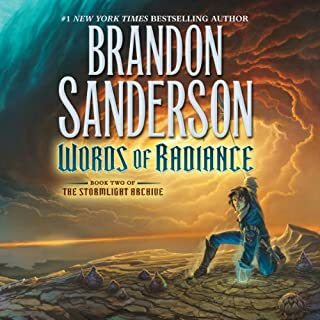 The world created by Brandon Sanderson and stunningly narrated by Michael Kramer is not like any one I or probably any of us could have possibly imagined. As long as this trilogy was, I am so sorry to have it finally end. You will feel like you need to pull all-nighters. Your social life will suffer. If you use audio books while at the gym, you'll reach your goal weight as you easily lose track of four hours on a treadmill. You will be tired and dependent on coffee. This was me and it was worth it. Enter Sanderson's Cosmere at your own risk. I regret nothing. Why does he smile all the time? Because humor is all He has left. He believes that if you are always on time, it implies you never have anything better to do. He says "I've been very confident in my immaturity." 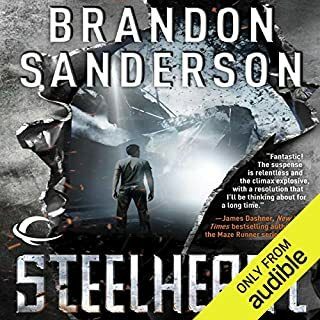 Brandon Sanderson earns five stars with this book, as he has with three of the four books of his I have read, the other just getting four stars. Sanderson is the Fantasy Writer of this Century so far. He does not borrow from anyone else to write his fantasy, it is all out of his head. Matter of fact this goes against all the fantasy laws. Usually iron is the bane of magic, which explains why elves, fairies, etc disappeared with the coming of civilization and metals. Sanderson has made metals the magic element. All of his books that I have read so far are totally different from the norm. In Elantris, Magic is the enemy. The Way of Kings is his masterpiece so far. Look at the ratings on this book, thousands have read it and it has an average of 4.6 stars. That alone speaks volumes. The book is not perfect and it was written early in Sanderson's career. For instance having a Feruchemist or Keeper sure comes in a little too handy as more then once he saves the day. There is also, especially in the beginning a lot of talking and planning. Hours of planning. Still I enjoyed it, the writing was great, the character development excellent, lots of twists and turns, and even with the planning there is still lots of really cool action. Fighting with metals reminds me of a character in Erickson's Gardens of the Moon, who is able to turn up down or sideways or left to right, etc. The characters are not black and white. Sometimes you are not sure who is the bad guy and who is the good guy (I love that). Fans of Abercrombie and Paul Hoffman will love this. Fans of The Wheel of Time series will recognize the great narrator Kramer. Listen to the story to see why I compare Atium to Spice.